The Bobike Mini provides your child exactly what is needed: Comfort, safety and a good position from which to enjoy all the things going on around them. Nestled safely between your arms your child can look inquisitively all around. Can there be any better way of discovering the world? The Bobike Mini also stands for uncompromising safety. Children aged from 9 months to around 3 years (or 15 kg, 33 lb) will enjoy maximum comfort and optimal protection in this attractively designed children’s bicycle seat. 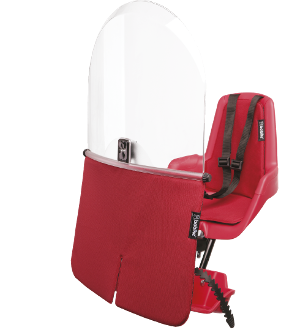 The three-point belt, the well thought out protective edges to the footrests, and the adjustable foot straps guarantee a feeling of safety for child and parent. The Bobike Mini fits all bicycles with a steel handlebar. The bicycle seat is attached to your bicycle’s handlebar and thus follows all your steering movements. The clever attachment allows the seat to be removed from the bicycle at the flick of a wrist and mounted on another bicycle. The Bobike Mini is available in black and the padding is easy to remove. You can adjust the position of the footrests to the length of your child’s legs. By removing the lowest cover of the footrest bar, you have an additional extra-low attachment point. The foot straps, together with the three-point belt system, ensure a comfortable and safe ride. The clasp of the extremely safe three-point belt is difficult for your child to open. Two hands are needed to open the belt. The Bobike Mini is approved according to the stringent European safety standard EN 14344. Copyright © 2012-2019 BobikeUSA. All rights reserved.